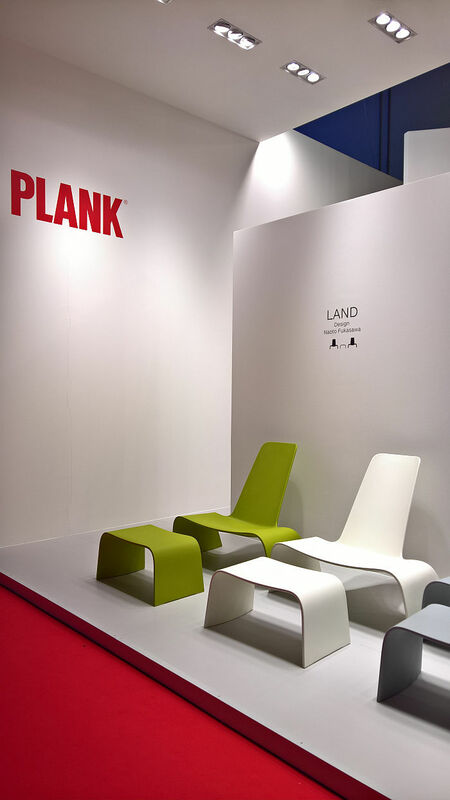 Land was first presented by Plank at Milan 2018 and so, technically, shouldn’t be allowed here; however, on the one hand given that this list last year contained Plank’s Cup chair by Konstantin Grcic we couldn’t have featured it, on the other hand in 2019 it was presented as an upholstered textile version, a version which is, effectively, a new chair when compared with 2018’s all plastic version, and on the all important third hand, Land is absolute joy of which we currently cannot get enough. Resembling something that one wouldn’t be at all surprised to discover in a Pierre Paulin or a Verner Panton archive, the upholstered Land has a self-confidence, self-evidence, that bequeaths it an autonomy from the conventional constraints of furniture vocabularies and allows it to be whatever you want it to be wherever you want to be. Based around a polyurethane foam upholstered steel frame Land is an eminently comfortable and inviting object and a work of contradictions, yet not of the negative type that you would expect to find in say an English Conservative government, but more the affirming type, those which allow a piece of furniture to become more than the sum of its parts; imposing yet reserved, monumental yet refined, a work that has something of the air of a throne, yet which far from leaving you feeling like an all-conquering potentate, the freedom allowed by and within Land returns you to the innocence of childhood and a desire to explore and discover. Not necessarily a living room chair, although, in the correct living room, say a Berlin Altbau flat with 3m+ ceilings, a Land standing alone in a corner is very much a living room chair, whether or not one chooses to sit in it or simply use it a a decorative element; where we can imagine the upholstered Land making a lot of sense, and bringing a lot of joy, is in a retail environment, a hotel lobby or in offices, be that as a public chair in a reception area or in the office office, a circle of Lands offering, for example, an informal discussion space that fits effortlessly into any contemporary soft ergonomics regime, including the associated acoustic advantages of large textile objects. The plastic version in contrast is crying out to be let outside, and while its presence may indicate it needs a lot of space in which to feel at home, its neatly achieved physical reduction allows it to fit in happily in even the most confined of spaces. In many regards Pinzo rescued our day, which isn’t the reason it’s in this list, but in the interests of full full disclosure; we’d been having a lousy time at the Milan Fair, had started to question not only the point of the Milan Fair but these dispatches themselves, then, and thoroughly unprepared, we stumbled across Pinzo. Crafted from pine, which explains the first three letters of the name, the latter two being a reference to Enzo Mari, who stands in may regards as Godfather to the work, Pinzo is a very satisfyingly reduced and reserved monolith, an object that has a very real presence, but not a domineering one, for that Pinzo is far too reserved and respectful, understands it is but a chair. 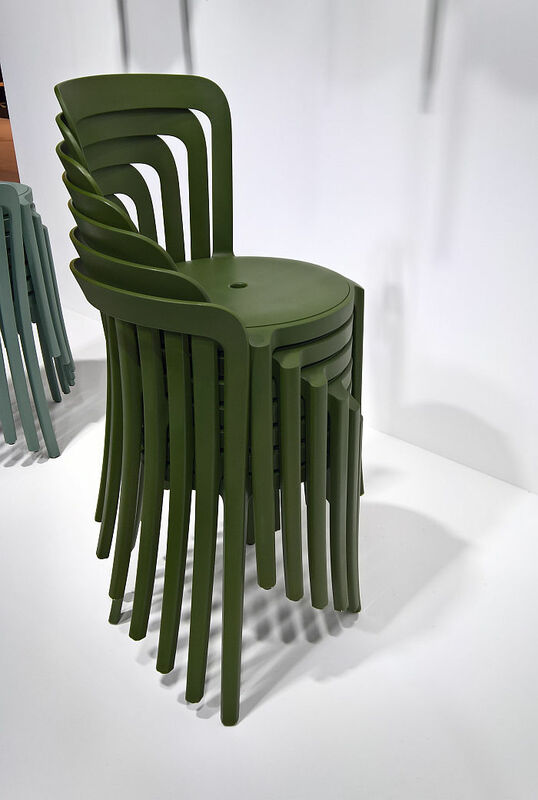 This reserved side of its character being reflected in and reflective of its materiality: crafted from pine Pinzo is solid and stable but not immobile, far less intransigent; the handle of the back of the seat aiding transportation. A handle which in any (potential) future outdoor version also allows for water to escape. Cut as much as formed the only real shaping undertaken being in the forming of seat and backrest, a light milling which not only aids and abets the seating comfort but for all breaks the quadratic formality and thus adds that little bit of visual tension to stop it becoming a monotone monolith. 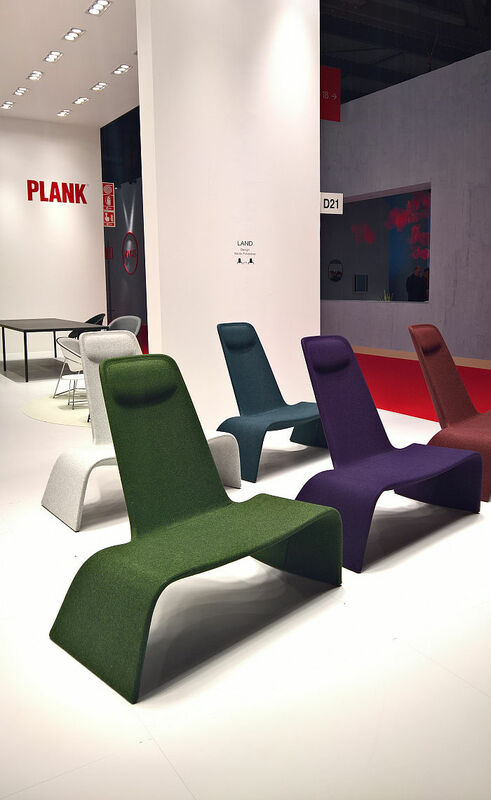 Neatly proportioned, well balanced, satisfyingly inclined and joyously comfortable the only consideration we had, the one small dark cloud in an otherwise clear blue Milanese sky…….. thoughts of Milan 2018 and Fugu by Jasper Morrison for Maruni…… However after long and detailed consideration of the two, and at the risk of sounding like an Arthur Mehlstäubler defending Egon Eiermann, Pinzo and Fuga are two fundamentally different works. They may share a certain formal similarity but not only is Pinzo a much more rugged, brutal if every bit as refined, individual, but in terms of their understanding of themselves, and for all the atmosphere that understanding brings, should bring, to not only the space in which they stand but to the sitter allowed to delight in their charms, they are two very different works. Developed in context of the HKDI Advanced Design Studio’s project Co-senior + which considered issues surrounding an ever ageing population and sought future-orientated integrated co-living solutions, Adaptive Cabinet is, for us, a work that is much more universal, one which transcends such thoughts, and something, we’d argue, is achieved through nothing more complicated than a stool. 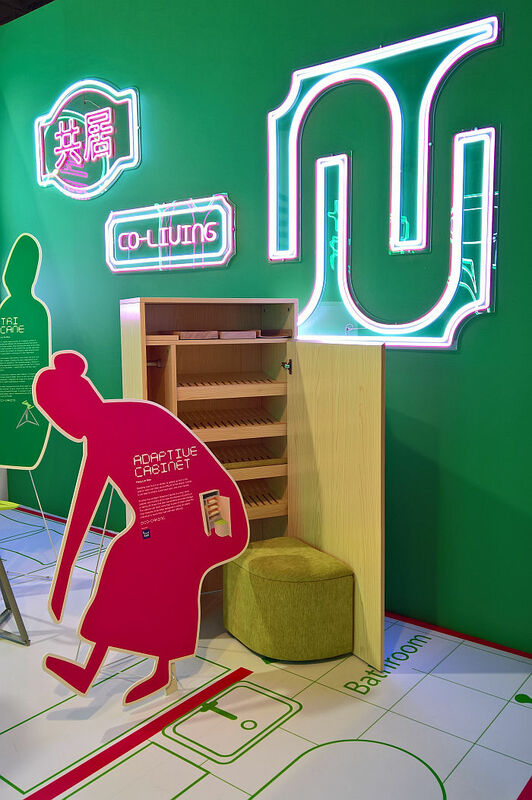 Shoe storage on which you can sit ain’t new; through placing the stool inside the cabinet, and thus making it only present when actually needed, Pang Lok Man has developed a concept whose inherent variability allows it the freedom to exist as a much more responsive piece of hall furniture. A freedom Adaptive Cabinet explores for all through the integrated storage space for keys, phones, letters, walking sticks, umbrellas, dog leads or indeed shoes; shoe storage appearing for all the world to be an unintentional benefit, an afterthought, of an otherwise unremarkable piece of hall furniture. And thus adding a layer of value. Making it more than a decadent shoe storage solution. As an object we’re admittedly not particularly liking the form, would argue it still has a lot of development work ahead of it, but as concept, very enticing and one we hope Pang Lok Man gets the chance to develop further. 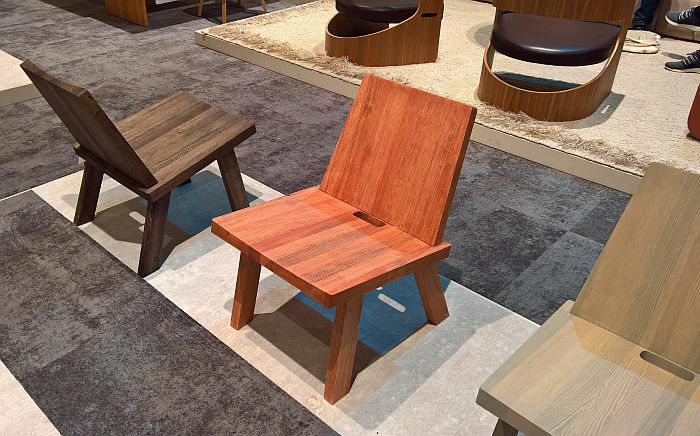 As previously noted, Mies van der Rohe’s Barcelona Chair is a chair born of the beach, Sergius Ruegenberg sitting himself in a hole in the sand of Berlin’s Wannsee beach and iteratively re-forming the hole until he found a comfortable sitting position, and then making the hole the seat. 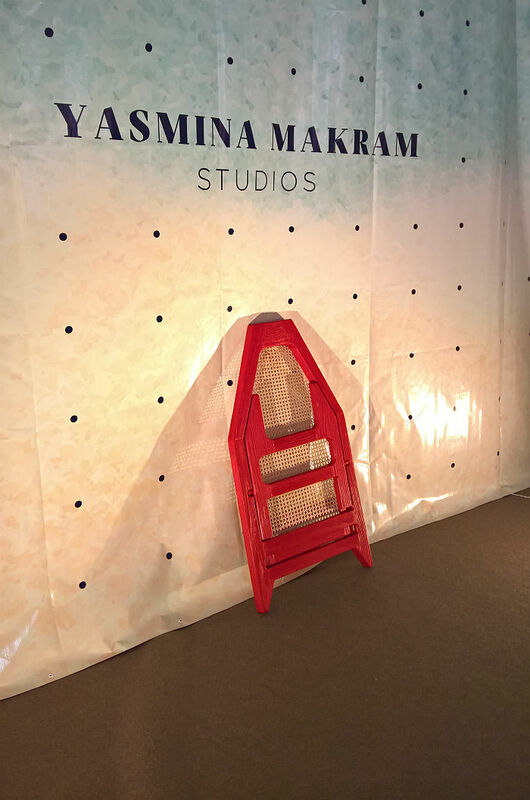 Nû Chair by Cairo based architect Yasmina Makram is in contrast a seat for the beach: and just as the Barcelona Chair wouldn’t really work if placed on the beach, Nû Chair only does. Needing the sinking into the sand to give it stability. Which on first reading sounds like a design fault, but (a) it’s a chair for the beach, so why not integrate the complexity of sitting on sand into the design and (b) the necessity of working with nature underscores the chair’s genesis in consideration on the relationships between man and nature, considerations translated into the act off planting yourself, through the chair, into the environment. 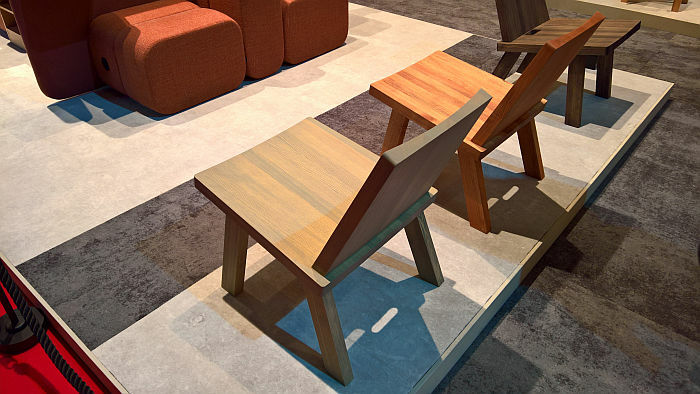 Sharing formal aspects with numerous vernacular traditions Nû is an intelligently realised work crafted from a plywood frame with bamboo cane seat/backrest, one which is more comfortable than you may imagine, were it not it wouldn’t be here, one which was presented in Milan in both a, let’s say, basic and an elegant version, the latter of which we forgot to photograph, and is collapsible, thus making it both easily transportable and storable. 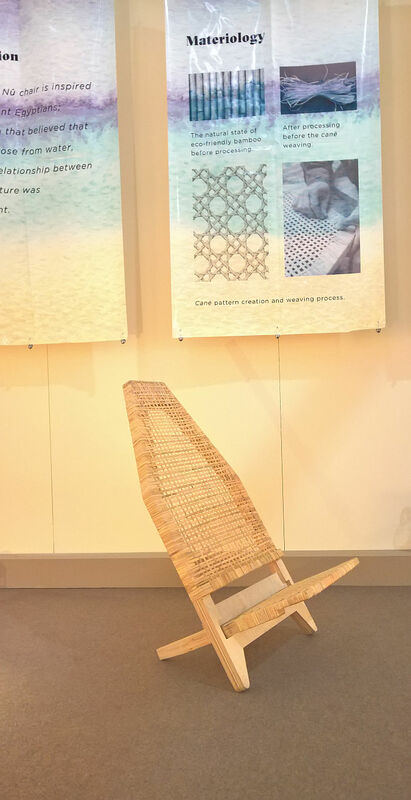 And as a work needn’t be restricted to the beach, or at least not real beaches, is also more than applicable as an object for any urban beach/beach volleyball court, but also for use as a garden chair on/in any sandy/loam soil. 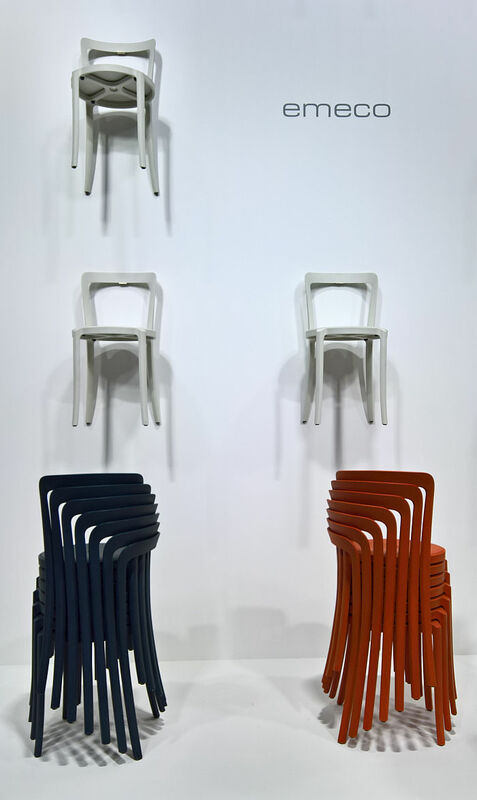 Approaching On & On by Barber & Osgerby for Emeco something in the ether whispered “portfolio filler” into our ears; Emeco, it intimated, in ever more hushed tones, for fear of revealing itself, needed a stackable multi-purpose plastic chair for contract spaces. 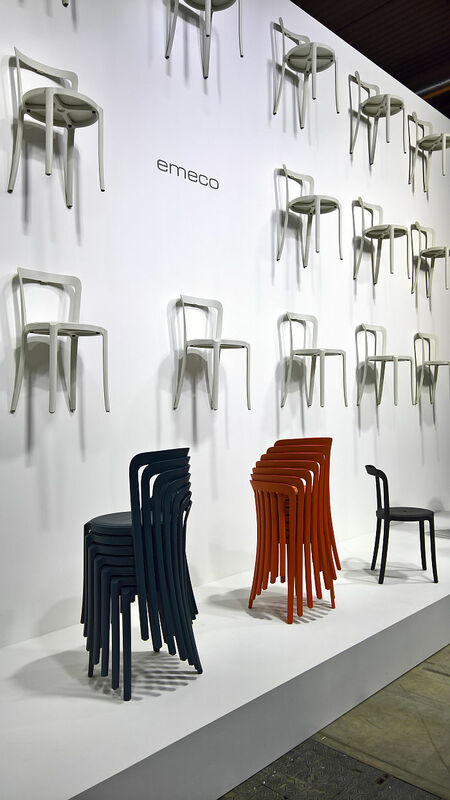 But, we responded, Emeco have numerous stackable plastic chairs, yes, replied the confiding tone, but all very quadratic, they wanted something rounder, something commanding, upstanding but less formal, something that could be used across a wide range of commercial, retail and hospitality scenarios, and something that set a contraposition to the rest of the portfolio. And the longer we listened to the arguments, the more seductive they became. Which isn’t to detract from what Barber & Osgerby delivered. Far from it. On the one hand, and assuming our whispering companion was correct and not maliciously seeking to lead us astray, Barber & Osgerby delivered majestically, meeting the objectives of such a, hypothetical, brief in body and more than surpassing it in spirit. 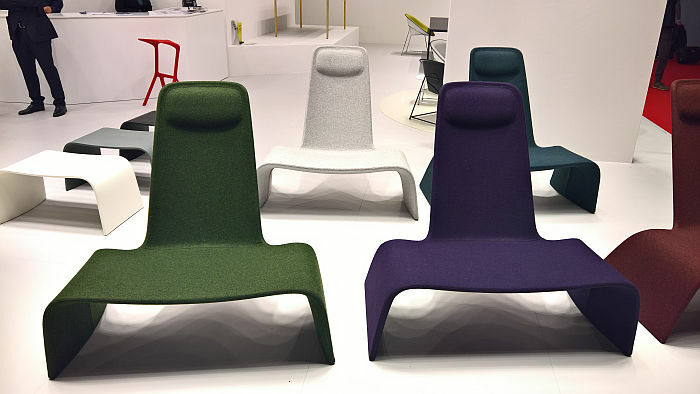 But for all developed a chair which, arguably, deserves to be produced regardless of such considerations. 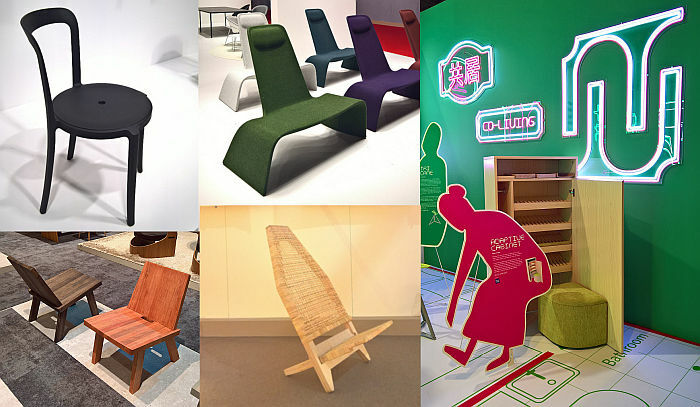 Crafted, predominately, from recycled PET On & On comes with a choice of three seats – recycled PET, plywood, textile – whereby one of the genuine joys of the project is that the seats are simply screwed on and thus can be changed as and when required, and thereby, for example, making the chair suitable for indoor and out: indoors, for example, with textile seat, outdoors with rPET, and where the small hole in the seat allows any accumulated water to drain and drip away. 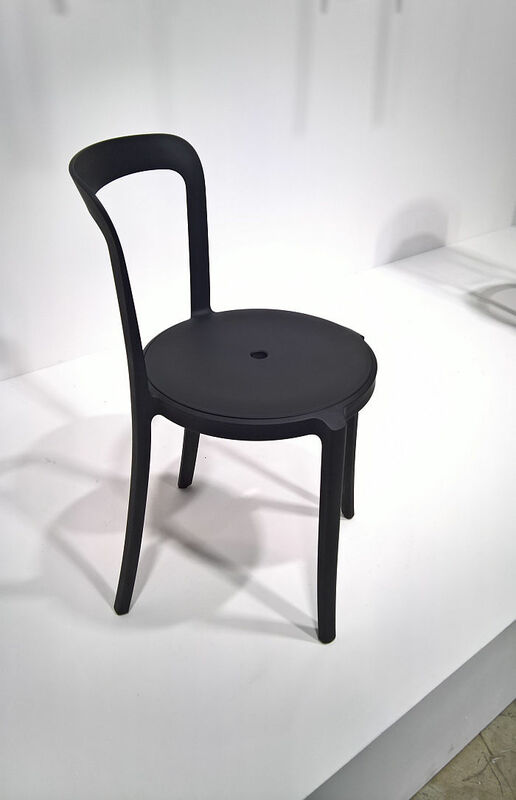 Formally presenting itself with a pleasingly unfamiliar familiarity, On & On is very much its own chair, while at the same time a work which gratefully acknowledges the long heritage of chair design, for all, we’d argue, with a silhouette informed by a Thonet 14, but a functionality leaning much more towards, stacking upon?, an Alvar Aalto 68. Intelligently scaled and nicely proportioned On & On is a lot more physically present than it is materially, it has a mass, a proper mass, but not the sort that means you need a team of horses to move it, but more one that not only prevents in been blowing about in the wind, but ensures a safe, secure, comfortable sitting experience. And when not providing such it can be elegantly stacked in the corner where it is every bit as decorative as it is functional as when unstacked. And despite what our elusive chaperon may have implied, is also very much a chair for the private, domestic space.